So, boys and girls - the grass is green, the sun is out and summer is in full swing! So, boys and girls – the grass is green, the sun is out and summer is in full swing! That’s great, of course, but some of you may be wondering where’s the best place to spend the long hot days and the short cool nights. Well, that’s easy: Park Gorkogo! 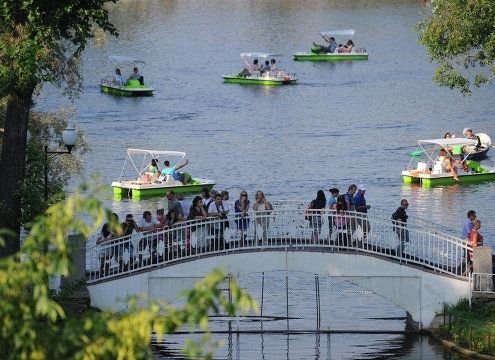 We here at My Guide Moscow believe that Park Gorkogo has got it all for a perfect summer day: beach, sports, bars and restaurants, a cinema and loads of culture. Below you can find a brief history of the park and a compilation of the coolest and funnest things to do in Moscow’s main park. Park Gorkogo is the central Moscow park, which is located in the heart of the city, steps away from Oktyabr’skaya metro station. The park was initially opened in 1928 and stretches 4 kilometers along the Moscow River. It is divided into two parts: Neskuchniy Sad (dating back to 1753) and the “Parterre”, which opened in 1923. Ever since its opening the park has always been highly popular among Muscovites and tourists alike. The Avant-garde architecture of the famous architect Melnikov made it something special and unique and many even say that this park revolutionized leisure in the Soviet Union! After the collapse of the Soviet Union, Park Gorkogo was turned into an amusement park full of old, unsightly and often dangerous roller coasters and other carnival rides but all of that changed completely in 2011 following a total redesigning and remodeling. The rides were removed, the entrance fee eliminated, free wi-fi set up across a large part of the perimeter and the park was transformed into an eco-friendly and very European recreational area. 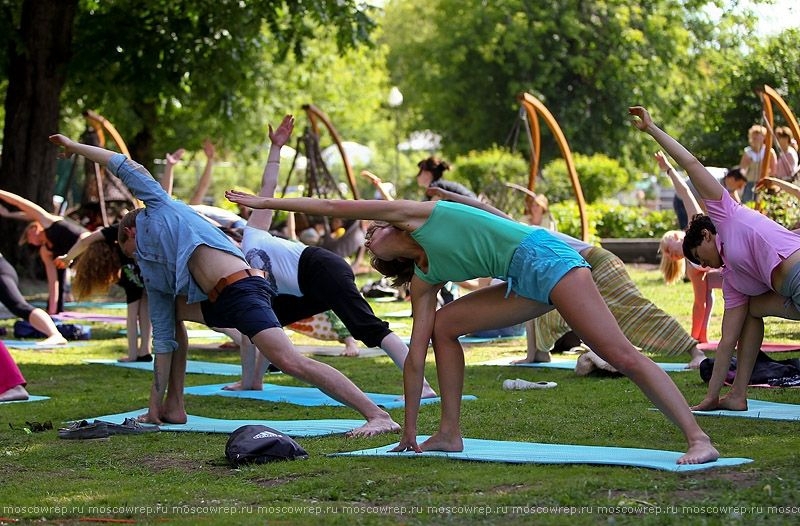 Summer is when fitness buffs and people on the occasional work-out flock to Park Gorkogo. Each year the park’s director, Segei Kapkov, comes up with new ideas and opportunities to help the people of Moscow lead an active lifestyle. From chess to ping pong, to tree-climbing to BMX-riding – Park Gorkogo truly has something for everyone! Head on over to the Sport Center, which is located right in the middle of the park, closer to the Pushkinskaya Embankment. The Center provides not only information about all the sports facilities but also changing rooms, showers and lockers. So what’s on offer? For 700r. you can practice everything you’ve picked up from watching Agassi swinging his racket on TV or if you’re a complete newbie in the world of tennis one of the highly qualified tennis coaches will teach you what a good grip means. The Ping Pong Club Moscow is the brainchild of a famous Russian photographer and a table tennis aficionado, Alexei Kiselyov, and as of 2011 the club calls Park Gorkogo’s Neskychniy garden home. It’s open daily from 10:00 until 21:30 and apart from 40 tables also provides equipment rental services and a table tennis school for those who feel like a friendly game of ping pong. Another venue offering table tennis is the Puma Social club but that’s not the only thing you’ll find there! BMX tracks, a parkour and a skating pool were set up by this wonderful sports brand to ensure that extreme sports lovers have a place to show off their killer skills. A very modern bike trail stretches from the start of the Krymsky Bridge all the way down to the Vorobyovy Gory embankment along the Moscow River. Anyone can rent a bicycle or an Electra Tandem bike, just make sure you have your ID and 1,500 roubles on you to leave as a safety deposit! A Nordic walking club also operates in the park so you can use the wonderful trails to learn a sport that’s great for keeping the heart and body in good shape. You can also rent roller skates by the same scheme as bikes and take part in the free group lessons for beginners or freestyle slalom skaters. You don’t need to sign up – just go on the school’s forum and show up at the next scheduled lesson! Joggers are everywhere in Park Gorkogo and there are many reasons for that. A lot of effort has been put into preparing the most beautiful running paths and a state of the art infrastructure of showers, locker rooms, cubicles and drinking fountains. Special jogging training sessions are held everyday and start at 20:00 on weekdays and 12:00 on weekends. The best thing is that it’s absolutely free and the whole park is yours! Another sports equipment giant – Reebok – established the “Reebok Crossfit Dropbox”, a revolutionary training system that promotes full physical development for people of all ages and levels of experience. The training events are overseen by experienced trainers, who not only guide you through your crossfit training, but also advise you on a diet and training schedule most suitable for you. Training sessions are varied and never get boring and, best of all, are absolutely free! From May to October you don’t have to buy expensive flights to Spain or Greece in order to get some beach sport action going…if beach volleyball/badminton/football/handball are your sort of thing, just call the sports center to reserve the field for you and your friends and jump barefooted right into the sand! An exercise spot with all sorts of monkey bars where you can set a new record for the amount of pull-ups you can do is open in Neskuchny garden and there are even training sessions weekdays from 19:00 until 21:00 and weekends between 12:00 and 16:00. Nearby, there is also the “Panda Park”, a tree climbing adventure park located in the trees, which has three exciting and intricate routes full of obstacles to overcome for professionals, beginners and children. If getting your sneakers on and getting sweaty is not your idea of fun - worry not, Park Gorkogo is full of other fun, cultural and serious activities for working, learning and relaxing. Perhaps one of the best activities for relaxing is watching a movie but you don’t have to be cooped up in a dark and dusty cinema hall to do that. 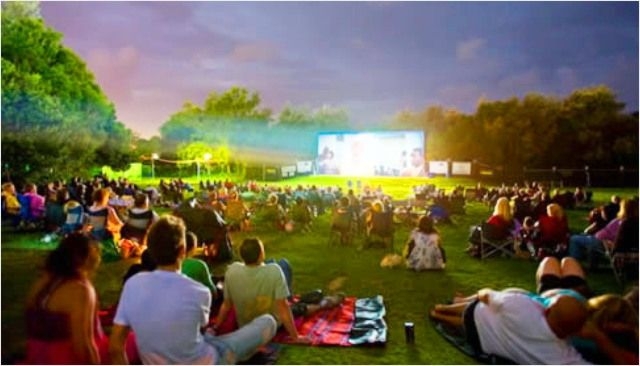 A visit to the open air Pioner cinema means getting cozy in a beanbag, breathing in the warm summer air and enjoying the latest blockbuster or a piece from the world of art-house cinema. Popcorn, of course, is available for purchase. This is not the only thing that goes on at Prioner. If you’re new to Russia and want to brush up on your knowledge of Russian history, pop down every Friday at 18:30 where the guys from Bears and Vodka will tell you who had the coolest moustaches in Russia, who built the weirdest building in Moscow and why there were seven tsars and then none at all. Every Thursday, weather-permitting, from 19:00 until 21:00 amateur painters gather in the Neskuchny garden an “en plein air” session to discover light harmonies, the symbolic language of color and contrast and composition techniques free of charge under the guidance of experienced art teachers. Come take a deep breath or fresh air at the famous Gorky Park Greenhouse, which has been revived following a full restoration. A variety of lettuce and spice are now growing in the eco-friendly Greenhouse. Plans for developing a garden rental program are in the works! Fancy a look at the starts for a mere 50 rubles? Pop by the Observatory which is once again open to the public and is now equipped with a new dome and a new telescope. Breath in, breath out...that is the slogan of the park’s yoga program in collaboration with Yoga Journal magazine. Start the working day with a free yoga session (from one of the best teachers of the capital) at 8am to fill up on energy or join a class at 8pm to let out steam after a full day’s work. Every working day is dedicated to a different style of yoga, ranging from more traditional ones like hatha yoga and finishing with specialist styles like IT (intelligent) yoga. Those who remember Park Gorkogo full of old rusty roller coasters and other rickety rides also remember overpriced shashliki from unsightly little tents as the only places to get a bit of grub around the park. To everyone’s joy those days are over and now every eatery in Park Gorkogo is a culinary delight in its own way. Here are some places to go if you’re feeling peckish but not in any mood to spend lots of rubles. Red Espresso has quite a varied and reasonably priced menu with paninis, sandwiches, salads, freshly-baked goodies and coffees, teas and freshly-squeezed juices. Glow Subs is a trendy new concept for city eating: always fresh vegetables and freshly baked bread, a well thought-through menu, convenient packaging and friendly customer service means there’s a sub for everyone!A burger for 179r.?! Yes please! Just look for the green food truck that is the Burger Vick to enjoy a true American diner experience for a wallet-friendly price. Last but not least, Wokker is the place to go for a delicious and healthy wok (seafood, chicken, pork, shitake mushroom - you name it!) and all for 250r.! For dessert look out for one of the many ice cream trolleys selling frosty delights reminiscent of the Soviet times. Not a fan of fast food? More in the mood to sit down, relax and soak in the summer spirit? Then here are some of the places in Park Gorkogo that are especially good for that. Lebedinoe Ozero has become a favorite among Moscow’s trendy and hip thanks to its original interior, a lakeside terrace that allows you to gaze at the beautiful white swans swimming by and a food menu that boasts Thai and Russian classics, as well as an extensive drinks menu. On a beautiful sunny day there is, perhaps, no nicer place to have lunch, a romantic dinner or just an ice cold drink than Olivkovy Plyazh (Olive Garden). 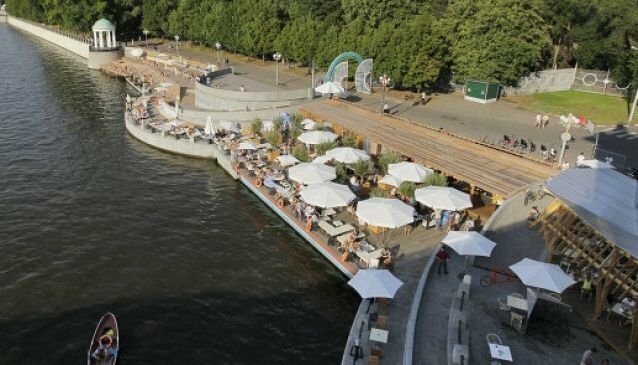 Located right on one of Moscow’s most beautiful embankments, this lovely little cafe has everything to create a true feeling of a summer resort: tanning beds, white umbrellas, delicious icy beverages and a fresh breeze. Mercato is a little piece of Italy in the middle of the park. Expect generous portions and authentic tastes all served to you on the restaurant’s spacious summer terrace. A brand new addition to the park’s culinary repertoire that is not to be missed is Veranda. An airy terrace, a dacha atmosphere, an abundance of plants and a fresh summer menu makes this the ideal spot to take a loved one or spend a family outing. Perched right on the beautiful Golitsinsky Pond, Dom Rybaka (Fisherman’s House) was the first restaurant to open in the renovated Park Gorkogo and is still serving top quality, second-to-none seafood with a slightly Spanish twist in a tranquil surrounding. To shake things up a bit Dom Rybaka does have an entertainment program running every evening Thursday to Sunday. But do keep in mind: most of these restaurants and cafes are not very cheap or are just outright expensive. Teplitsa is an eco-cafe in the Neskuchny garden dedicated to fresh healthy food and an always positive atmosphere. In the mornings you can do a bit of yoga, on Friday nights there’s always something lively going on and on Saturdays you can practice your drawing skills. And finally there’s La Boule, a cafe beloved by Moscow’s hip artsy crowd. Food and drinks are not that expensive, the atmosphere is French, the DJs spin bouncy underground tunes and the possibilities to play petanque are limitless! These are only a few of the activities and places worth checking out in Park Gorkogo. So as not to overwhelm you with choice, we have picked out some of the best and most exciting things for you to do on your trip to Park Gorkogo. But there’s always something new being announced on the park’s website so be sure to keep your eyes peeled!